Did you watch ‘Land of the Dead’ and notice the zombies are gradually getting smarter? Do you watch ‘The Walking Dead’ and wonder what it would be like if the Walkers evolved into the DRIVING dead? Wonder no more! In the next saga set in the Night of the Living Dead universe, the normies (the rich ones, anyway) get their jollies by making zombies race cars for entertainment purposes. 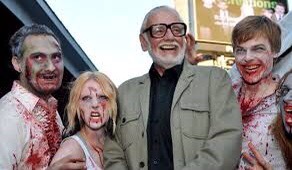 George A. Romero will not be directing, though he is still significantly involved. Instead Matt Birman, the second unit director of ‘Land of the Dead’, ‘Diary of the Dead’, and ‘Survival of the Dead’ will take over. The two co-wrote ‘Road’ together. Oooookey-dokey. Might be good, might be good. If nothing else, zombie NASCAR is a new twist on the tired old subgenre.